Philip Patrick Murnion, age 93 of Jordan, Montana passed away on November 7, 2018 at St. Vincent Hospital in Billings, Montana. Philip was born on November 17, 1924 to John Joe and Alma (Howe) Murnion. He grew up in a family with 6 siblings. Philip attended country schools in the area and graduated from Garfield County High School with the class of 1943. After graduation he was drafted into the United States Navy where he served his country in WWII. After the war, he came back to Jordan to the family ranch where he helped herd sheep. 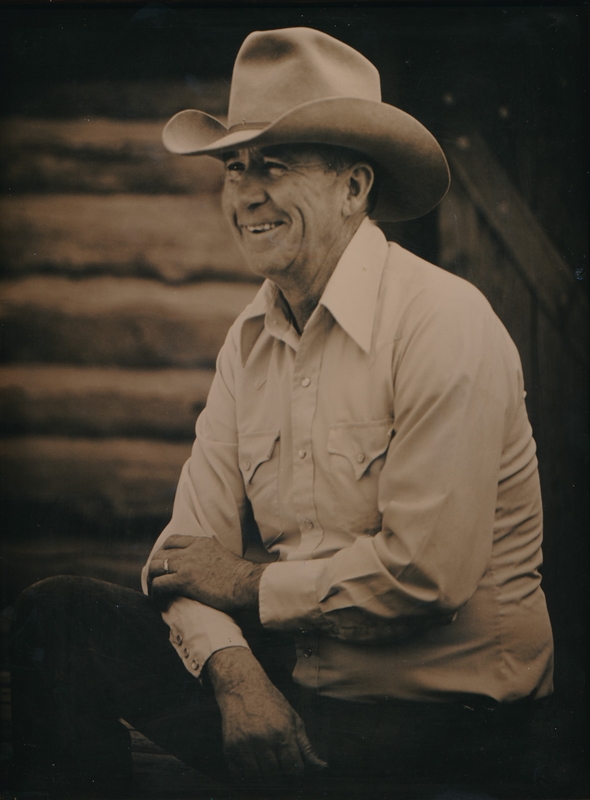 He purchased the ranch north of Jordan in 1954. On November 19, 1955 he married Cynthia Saylor in Jordan, Montana. Together they had nine children. Philip loved ranching and most of all loved his family. He had a tremendous eye for a good horse and loved to work with them. His family will miss being with him Sundays after church for his famous sourdough pancakes. He loved to play the card game Casino, shoot pool, going to team roping’s with his good friend and roping partner Hank Green. He held many roping’s at the ranch, and held practices for the up and coming young ropers. He was a member of St. Johns the Baptist Catholic Church. He was a member of the VFW, and for many years helped put on the 4th of July Rodeo. He was a member of Little Dry Roping Club and received the heritage award from the Montana Rodeo Wall of Fame. Philip is survived by his children: Cavin, Colin (Carrie) and their children Charli (Beau) Clark, Connor and Kelly; Teresa (special friend Glen Beecher); Maury (Carla) and their children Douglas and Tori; Perry (Betty) and their children Brieanne (Ben) Sulser, Kailyn (Brandon) Smotherman, Shelby (Brett) Beery, Seth and Koree; Jay (Leslie) and their children Raegen, Kendall and Ridge; Tyler (Beth) and their children Seanna, Edward, Dawson, Ellie, Brooke, AJ and Layton; and Joye Murnion; his great grandchildren: Caysen Clark, Kyler Clark, JW Smotherman, Parker Smotherman and Avery Beery; a sister Kathleen (Tom) Fowler of Conrad, MT. He is also survived by many nieces, nephews and cousins. He was preceded in death by his parents, his wife Cynthia in 2012, a son Edward in 2001 his brothers: Clarke, James, Coleman, Barnard and his sister Mary Johnson. A Rosary and Vigil service will be held at 6:00 p.m. on Tuesday, November 13, 2018 at St. John the Baptist Catholic Church in Jordan. Mass of Christian will be held on Wednesday, November 14, 2018 at 11:00 a.m. at the Garfield High School Gymnasium in Jordan. Rite of Committal will follow in the Pioneer Cemetery. Condolences may be sent to the family by visiting: www.stevensonandsons.com. Should friends desire, memorials may be made to the Jordan Ambulance Fund or to the charity of one’s choice. I am terribly sorry to hear of your loss. Phil was a staple in the community for so long. Word don’t come easy. Prayers to all. This breaks my heart. Philip was so good to all of us when I was in school in Jordan. He supported the rodeo club to the max. All of you are in my thought and prayers. Philip was a king to all of us. RIP dear man. Words cannot express how much my heart is aching for all Ya’ll. Philip was my dad’s best friend. Philip was like another dad to me. Praying for comfort and peace in your hearts from Father God. all Philip family may God Bless you and the family ,May God comfort you all RIP. Condolences go out to all of Philip’s Family. May you find comfort knowing he is the loving arms of our Savior Jesus Christ. I am sorry to hear about Philip’s death. I will offer Mass for him in the near future. May God comfort you with your memories. Our prayers are with you alll. So sorry for the family. Thoughts and prayers to each of you. My sincerest condolences to all of Phillip’s children, grandchildren and extended family. May you find peace, love and comfort as you mourn your loss. So sorry for your loss. Treasure all those memories he made with you. Philip was truly a family man, but he supported his community and friends also. Prayers to you all. My thoughts and prayers for all of Philip’s family. He was a great man. To the Family of Phillip Murnion: I am so sorry to hear of Uncle Phillip’s passing. So grateful I stopped to see him in May. He was a true cowboy and with a big heart. My condolences to all his family. Condolences and Prayers for Phillips Family . May you find Comfort in all of your memories and in Gods Love . We send our sympathy and prayers at this difficult time to all of Phillip’s family. He leaves behind many wonderful memories and may God grant peace to all. Phiip was a quiet and caring man, never a complainer. I feel that I knew him fairly well. I had many encounters with him, all pleasant in spite of circumstances! I know he will be missed by his family, not to mention the many friends he had. Phil was quite religious and I am certain God will welcome him with open arms. He will always be in my prayers. Thinking of all the Murnion family at this difficult time. Please know that our prayers are with you. Philip was always so welcoming to us and we so enjoyed his stories and his wisdom. What a wonderful legacy he leaves behind. Thinking of Phillips family and friends. May God bless you all. Your family is in our thoughts and prayers. Philip will be missed by many. We were blessed to know him, and thankful for his sacrifice for our country as a soldier, and for his hard work and dedication to his family and the Jordan community. So sorry to hear of Philips passing. Thoughts and prayers to everyone. I know he will be greatly missed. So sorry for your loss. Our thoughts and prayers for Philip and his family. I’ll always remember Uncle Philip leading the rosary before mass, and going to his house to get my first horse. I am so sorry to hear of Philip’s passing! May God’s hand be with you to comfort you during this time! We are so very sorry for your loss Phillip was a very great guy. I know Kevin has spoke very highly of him. So sorry for your loss. Your Mom and Dad were always cheerful and so involved in all activities in Jordan. He will be missed by many. Chris and I send our deepest sympathy to all of Phillip’s family. Chris has many great memories of Phillip from his days with the Little Dry Roping club, and functions at Jordan. All of you will be in our thoughts and prayers. God bless. Our sincere condolences to the Murnion family. Phillip was such a kind, gentle man who will be greatly missed by all of us! Hugs of strength for each of you during this difficult time. Phillip and Cynthia were the best! They both had wonderful smiles and something pleasant to say. They raised fine children that I got to enjoy in the classroom. I miss Cynthia every time I come to Jordan and now I will miss seeing Phillip, too. God bless the Murnion family at this time of sorrow. I send my prayers in hopes that you find peace with Phillip’s passing. He was a wonderful person and I will treasure the many visits I had with Phillip and all times I visited. I am so sorry, Phillip was a wonderful man. He will be very missed. All my love to the Murnion family. My thoughts and prayers are with all of Phillip’s family and friends. He was a great guy. He was so good to all us “kids”. Spent many hours in his arena and watching him rope. He will be missed. Our most heartfelt condolences. Holding all in our prayers. May your memories give you peace. My deepest sympathy for your loss. Prayers and condolences. We were so very sorry to hear this news of Phillip. There are so very many memories that come to our minds and hearts when we think back on the years that we were closer to both Phillip and Cynthia. All of the times for high school rodeos and ropings and just seeing them and visiting a bit. Both were wonderful people. Phillip was a special man and always had time to spend with kids. He always had a smile like nobody else. You are all in our thoughts and prayers. Sorry we couldn’t be there for the services but we want you to know that we were there in thought.